Do you have occasions when you need to take a toddler along and keep them quietly playing in one place for an extended length of time? Whether you keep your children in church with you, need to go to an appointment where there is likely to be a long wait, need to take a homeschool class with other children or want to get through a meal in a restaurant in peace, mat time is invaluable. The toys need not be fancy or expensive, but it helps if they are new to the child. Things to fill and spill, tip and pour, shake and rattle (not for quiet times! ), stack and read, open and shut, will all be a hit. When I pack my take-along toddler toy bag I just walk around the house looking for a bunch of interesting containers and a selection of bits and bobs to put in them. A pile of brightly painted metal washers from the shed in a hinged tin, matchsticks and a container with a hole to poke them in, large stones and a munchie mug for posting, nesting blocks from a wooden puzzle, musical instruments and a tackle box filled up with odds and ends gave us around an hour of peace on a couple of different occasions before the novelty began to wear off. Training children does take time and is not easy, but a young child who will contentedly play with their activities within a set boundary is a joy to take out. One-on-one focus time – how do you do it with lots of children? Spending one-on-one time (focus time) with our children is important, but how do you find time to do it with a large family? Focus time for us has changed a lot along the way. When I only had a couple of children I had it planned as a set timeslot every day with each child. It’s especially important for the toddler of the family that they have some attention early in the day before popping them into playpen time or other independent play. We would read a story or play with the dolls house, toy cars, Lego or whatever toy was a favourite of the child at the time. This daily filling of their love tank early in the schedule set them up for success with room time and other alone times later in the day while my focus was on other children or tasks. Later in the day I would spend some time with the older children. Once we had our twins it became too cumbersome to fit one-on-one time into every day so we moved to having an “hour of power” one afternoon a week. Whenever the children asked me to do something with them that I could not accomodate then and there, I would tell them that that was a wonderful idea for our hour of power. We would add it to a running list that we kept so that we didn’t get to the special hour and have no ideas. The kids were happy that it was a delayed “yes” rather than a no and I was able to do it at a time that was suitable for me. The toddlers still had some focus time early in the day on a daily basis. As the older children were getting to an age where playing with toys at home was no longer suitable for focus time, we changed to fortnightly dates with Mummy or Daddy. The babies and toddlers in the family still had their focus time built into the daily routine early in the day and the older 5 were on a rotating schedule to go out on a Saturday for a couple of hours – 1 child per fortnight. Of course there were still plenty of incidental times along the way when we spent time with the children other than these special dates. Some of the issues that we found with this was that 10 weeks was a long time to wait for the next special date and having these set times seemed to bring with it a sense of ungratefulness and entitlement rather than thankfulness that we were taking the time to do it with them. A lot of talk went into how long it was until the next date, with almost a depression after their turn as they realised how long it would be before they went again. It put a lot of pressure onto us to keep it up and not skip a turn and life tended to get in the way. The dates also needed to be something bigger which often came at a cost financially. We decided that as a long-term strategy it wasn’t working for us or the kids. The next method we call date cramming. We would take a couple of days and take every child out on a date with either Mummy or Daddy all one after the other. We liked this because everyone got a turn very quickly and the children did not know when we planned to do it – we would just announce it unexpectedly and they were very excited and thankful that it was happening. We took the younger children first and then the older children as they had a better grasp of time and were able to understand that their turn was coming soon. All done and dusted in 2 or 3 days with no drawn-out waiting. We still do this as we find it works well for us – family holidays are a great time to fit it in. 7 children later we have settled into a very informal system. Except for the toddler, we don’t have it written into our routines (no expectations, no crummy attitudes) but are mindful that it is important to proactively build relationships. It’s different for every child and age. The holiday date cramming is still happening a couple of times a year, with the rest of the alone times balancing out informally in a a whole variety of different ways. Our nearly 2 year old comes into our bedroom as soon as she wakes in the morning for some snuggle and tickle time with Mum and Dad before we start showers. Homeschooling starts after breakfast and provides opportunities for the 4-year-old and our 6-year-old twins to have some individual attention as they have their turn to sit on my lap and do some reading or maths or other subjects I save for this time. Our 8 and 11-year old girls are involved in a church dance group and the 11 year old in a girl’s choir. The trips to and from these events, plus occasional extra rehearsals etc. provide some one-on-one time connected with something that is special to them. Our 13 year old is up later than every other child and naturally gets lots of informal time with Mum and Dad as we chat while doing dishes, play board games, look something up on the computer or whatever comes up as a topic of interest. He will often accompany one of us if we head out to the shops in the evening or just sit about and chat. Whenever my husband or I run an errand over the weekend we make a point of taking along just one child for some special time – usually the 4 or 6 year olds as they do not have as many other opportunities that naturally crop up without planning. We have started some traditions connected to birthdays such as going camping alone with a parent when they turn 7 or horse-riding when they turn 9. We occasionally have girls/guys day out – when I take all the girls to a special event or Daddy takes all the boys. Our next event will be a winter showcase concert that the girls are looking forward to seeing. While this is not strictly alone, it still gives us opportunities to focus on individuals within the group. Daddy has been hiking with the older 3 children a couple of times in the last year which involves long walks (plenty of time to chat to individual children) and overnight camp-outs before hiking back. Coming up to holiday periods I will sometimes get the children to make a list of all the things they want to do with me alone while we don’t have school work to get through. If something needs to be done like purchasing new sneakers for someone then we will turn that into a date opportunity and the occasional birthday invitation or other special event involving only one child also gives us some time alone. I frequently have a helper work in the kitchen with me to prepare a family meals and there are other times when we sit and simply read a story or work on a project with a child. Keeping love languages in mind is very important when thinking through focus time. The older children wanted help making Jedi capes to use for their home movies so this was a good opportunity to tackle a small project together – acts of service children all happy! A quick trip to the local shopping centre for some new socks has the “gift” child showing the world and overflowing with joy. Piggy backing my “physical touch” boy to bed and taking 5 minutes to tickle and cuddle before lights out each night fills his love talk. The “quality time” kids need just that – time and lots of it. They are the hardest to fit it and the ones we have to most proactively work to accomodate. So yes, our children are not going on amazing Princess date with Daddy every weekend or heading out to expensive all day experiences with Mummy every other week, but they are well loved. I think we need to take a step back from the pressure to heap money and experiences on our children and ask ourselves what they need. Perhaps you just need to go and play a game of Monopoly or fix the toy you’ve been promising to get to. Filling their love tanks and letting them know they are special and loved is what its all about for us. These pattern blocks have been available to my children for table time and room time for years and I can’t remember the last time a child voluntary took them out of the cupboard to play with. As our pretend play area was also laying dormant, I decided to pack the home corner equipment away for a while (toy rotation is a wonderful thing) and set out something new. I originally started with 1 large mirror and 2 lids full of jumbled blocks, with the idea of giving my almost 2 year old something she could use while in the games room without getting into other areas that she does not have the freedom to access. The moment I unveiled the new attraction though, it immediately became obvious that I was going to have many children interested, not just one toddler! After the addition of another smaller mirror and a couple of wooden trays, most who were interested could join in, however I even had to pull out an old picture frame as another base so that everyone could be in on the action. My 13 year old hasn’t touched a pattern block for years and yet there he was, busily building the Millennium Falcon, while his almost 11 year old sister methodically sorted the blocks into separate shapes and colours before commencing her building plan. The nearly 2 year old chose to pick out every single yellow hexagon during her first attempt (shape and colour recognition anyone?) and the little boys made random sculptures or bunches of Tie-fighters! If toys are not readily available, then children won’t use them. Sets that are upended in toy boxes or buried in the back of a jumbled cupboard will rarely see the light of day. 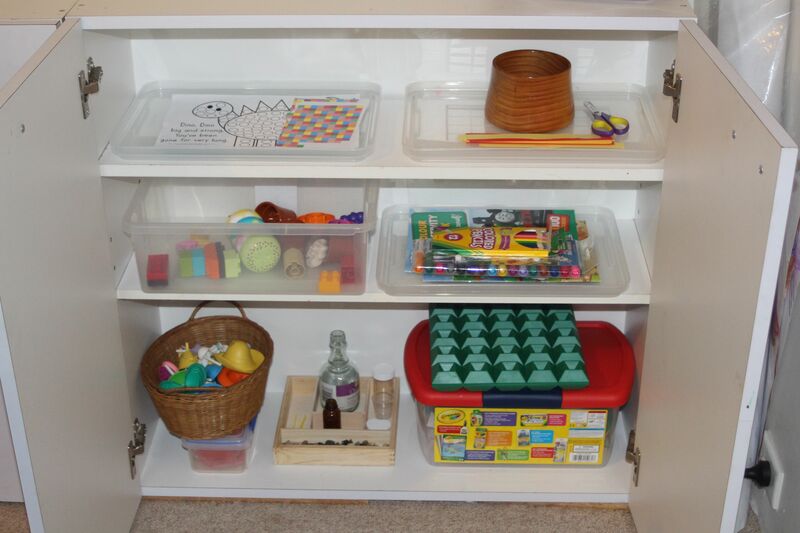 Store toys in sets in containers that make it quick and easy to set out and pack them away. Toy rotation keeps things fresh. When a toy that has been out of sight for a while comes back out, it is like a new experience all over again. Use toys that are not favourites in new and different ways to spark interest. These pattern blocks come with puzzle cards that I usually set them out with. This time the focus was free creating. Set items out for highchair time, mat time, room time and playpen time that have not been used during free play for a while. They will be happily played with when there is no other choice available. Free play time and age-appropriate choice as part of a flexible routine needs to be handled wisely. It is also important to teach children to play with what you tell them to play with, when you tell them to play with it and where you tell them to play it. A parent-directed routine will help you to raise obedience, self-controlled children who are not addicted to choice. Your schedule – how do you stick to it? For some, writing a schedule is easy but they never seem to be able to live according to their schedules. So, what to do about it? It takes mental and physical skill to learn a new habit and that’s what your schedule needs to become – a habit. The effort at the beginning to get the ball rolling is hard, but the longer you keep going, the less effort it takes to keep on going, until the schedule practically runs itself. Daily repetition is the key. Here are some pointers that may be helpful as you go about implementing a routine that will serve all the needs of your family and not drive you crazy in the meantime. Task orientated people need to put quality time/focus time with their children into their plan or they may feel like they are wasting time – if it’s on the list it feels more like a legitimate use of the time. Task orientated people may also need to schedule some time each day to achieve a measureable project – 15 minutes on a task that you can point to and feel like you have accomplished something TODAY. We know in our heads that the day-to-day parenting is helping us work towards very important goals for the future but we can lose sight of that in the every day sameness of it all. Somehow when I can point to the pantry and say “I cleaned out a shelf today” if helps feel like I am moving forward. You may need to have what I call a revolving focus. I can’t do it all with everyone all the time but I can get to it over time. This week I may be focusing on deep cleaning the house in my little minutes, next week on reorganizing my menu plans and recipe selection, the 3rd week everything is set aside to deal with a character training issue, the 4th week toilet training takes up all the available minutes. Over time though, with a revolving focus you eventually get to it all. Use those small increments of time throughout the day – the little minutes – while you wait for the kettle to boil, while the kids are packing up and coming to the table or whenever, to work on something small. Remind yourself why you are doing what you are doing. We are not parenting for the here and now or for our own convenience. We are training up children of God and there is nothing more important a Mother can be doing. After people finish counting my children and comment on how I must have my hands full, the next thing they say is often along the lines of “How do you get everything done?” The honest answer is I don’t get everything done. I don’t work part-time, I don’t meet my girlfriends for coffee several times a week, I don’t attend MOPS, Mother’s Group, Toddler Jam, Jungle Gym and the local playgroup every week. I have to choose my commitments based on my priorities, knowing that it isn’t my list I need to get through, but God’s! I have enough time to do everything He has for me to do. Frustration kicks in when I try to take on more than He asks me to. Jesus reduces my responsibilities to those of today and today is all He asks us me to cope with. We all have the same amount of time in our day and it is enough. If we start with God’s priorities we will be able to get everything that needs to be done and more abundantly than we expect. Perhaps we need to give up some good things to get on with the better thing of training our children? So how do we choose these priorities? Because we do have to choose between the good, the better and the best – they won’t all fit in. Give everything over to God – yourself, your home, possessions, time, body, mind, your children, your plans and projects, commitments, responsibilities – everything. Hand it all over and ask God what of these responsibilities He wants you to take back. What is his/her vision for the family? Remind yourself to be willing to hear the answer! Have a teachable heart that is open to the truth, even if you don’t see it quite the same way. Plan both short and long-term goals. Make a routine. Routine is the key to it all hanging together. Our long-term goals of life are only met by the daily disciplines we follow. The daily grind is what takes us step by step either towards our goals or away from them. Break large projects into day-sized chunks. An immense “to do” list is overwhelming, day sized chunks helps us to see that eventually it will all get done. Hold your plans loosely – be ready, willing and available for God’s plan B, acknowledging His right to alter your day. What will it take? Time, money, mental or physical effort? All change will take a decision by you to make it happen and an investment of some kind. Morning – get up early. Give yourself enough time for an orderly morning that includes time with God getting spiritually prepared for the day. We need time before the interruptions come to get God’s leading for the day and His perspective on what is most important, rather than letting the tyranny of the urgent take over. If we are honest with ourselves we know that we will achieve almost anything we really want to do and the same goes with our parenting. Sometimes the time, effort and commitment involved has us saying that we just “don’t have time” but really we do – we just don’t want to do it enough. Christmas is a time that I look forward to – making memories, continuing with traditions from previous years, special outings, celebrations, events and family times. As I have found every year though, this special time comes with it’s own negatives. The freedom of unstructured days, lack of routine, too many choices, plenty of special events, junk food and late nights (this year coupled with sickness) has predictably resulted in tired, cranky children who are not getting along so well and are not using their free time wisely. What to do?? A new year begins, the celebration cycle eases off and ta da – enter ROUTINE! I know from experience that the start of our homeschool year will solve many of these problems very quickly. The children’s days are filled with a balance of structured and unstructured times, responsibilities appropriate for their ages (chores) and a predictable flow of daily activities that allows me to get everything I need to do done in a timely manner as well. Less time together means that the children start to appreciate each other again and everything starts to run so much more smoothly. Life feels easier, the days are happier and we all benefit. Here is a peek into the newly sorted out activity cupboard for our 2 1/2 year old. We use these activities for table time straight after breakfast for around 30-45 minutes. In that time he will use 3 or 4 of the trays before heading off to room time for around an hour. It takes time, consistency and commitment on your behalf to teach a little boy (or girl) to sit and concentrate but it absolutely can be done. I do not have babies and toddlers who are/were just “naturally” able to sit and concentrate, it took work!